Author Armando Garcia-Davila takes us on a trip of a lifetime as four friends travel 7,000 miles cross-country on their motorcycles in the turbulent 1960s. The experiences of his main character, Tino, are alternately poignant, funny, mind-bending, and life-changing as he grapples with the issues confronting him: his first true love, bubbling racial tension, the morality of the escalating Viet Nam war, and a wafer of LSD in his pocket just waiting to be used. The Trip is a page-turner as Tino and his companions—his older and wiser brother who happens to be a priest, and their two friends—roar from adventure to adventure: spending uneasy nights in small town jails to save money; sneaking out of town under the mask of darkness to avoid the pursuit of Southern rednecks; and finally, for Tino, an out of body experience aided by LSD and spiritual forces beyond his wildest imaginings. With a lot of time on road we become privy to Tino’s thoughts as well as his adventures: His feelings about his close-knit Mexican family back in San Diego, and especially about his domineering father and how he might one day reconcile differences with him and gain his respect. 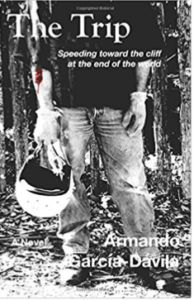 Armando Garcia-Davila’s prose—sometimes as poetic as the landscape, occasionally as gritty as the road beneath his tires, perfectly suits this well-paced story of a boy maturing, mile by mile, from a naïve nineteen-year-old into a strong man. It’s a book of discovery. It’s a real trip. Reviewer Elizabeth Kern is the author of Fire Angels, Mercy Goodhue, a Puritan Woman’s Story of Betrayal, Witchcraft and Madness, and Wanting To Be Jackie Kennedy.